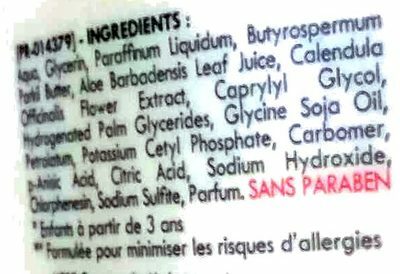 Aqua, Glycerin, Paraffinum Liquidum, Butyrospermum Parkii Butter, Aloe Barbadensis Leaf Juice, Calendula Officinalis Flower Extract, Caprylyl Glycol, Hydrogenated Palm Glycerides, Glycine Soja Oil, Petrolatum, Potassium Cetyl Phosphate, Carbomer, p-Anisic Acid, Citric Acid, Sodium Hydroxide, Chlorphenesin, Sodium Sulfite, Parfum. Product added on September 17, 2016 at 2:25:25 PM CEST by openfoodfacts-contributors. Last edit of product page on June 5, 2018 at 1:32:55 AM CEST by romain-irl. Product page also edited by beniben, nom0021, teolemon, tib-de-bar.